the flesh has nothing to offer. After this, many of his disciples left him and stopped going with him. Then Jesus said to the Twelve, ‘What about you, do you want to go away too?’ Simon Peter answered, ‘Lord, who shall we go to? You can remember big and small choices in life. Ones that affected life totally like a job, marriage, retirement, redundancy; having an operation or not..many more. Choices about the children that affected their lives – school, moving house…..
Life is made up of many choices, big and small. Human, spiritual and religious choices. Peter had this sort of choice today. Would he go after Jesus or leave like others did. He stayed and he would have many more attempts at that choice. Why did he stay? Our choices come from something within us. 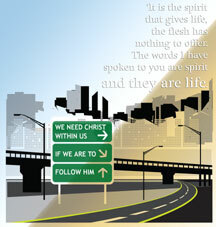 We need Christ within us if we are to follow him. Peter had enough of love for Jesus inside him to make this choice. It might not always be easy and he would give in later but come back. His choice eventually would be to answer Jesus’ question – do you love me? The choice for Jesus is the choice for love. In all sorts of ways. For those near at hand. If you choose Jesus then the hunger of the world as well as the tears of a family baby affects you. What we do in love for others comes from the deepest part of life. We need to fill our lives with Christ to be able to share this love in big and small ways . We need the company of other choosers. The community of faith and of the church. Peter says – to whom shall we go to? Lord we pray for support and strength in our following of you. This entry was posted in Gospel of John, Gospel Reflection, Liturgy Resources, Prayer Resources, Scripture, Year B and tagged 21st Sunday Ordinary Time Year B, August 23rd, August 23rd 2015, Donal Neary SJ, Gospel Reflection, Gospel Reflection for 23rd August 2015, Jesus, Jesus Christ, John 6:60-69, Lord Jesus, Love, Sunday Gospel Reading and Reflection.